Location: Troyan is situated 160 km northeast of Sofia and 22 km from the Troyan pass in the Balkan Mountains. 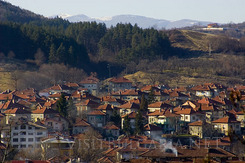 The town spreads along the terraced banks of the Beli Osum River at the northern foot of the Troyan-Kalofer ridge of the Balkan Mountains, at 450 metres above the sea level. Sightseeing : Troyan is famous with its magnifiecent craftsman masterpieces. During the 19th century various crafts flourished here - woodwork and pottery making taking a peak. Troyan is also famous with the School of Ceramics. There is also a Museum of Traditional Crafts and Applied Arts, where a collection of master craftsmen works are exhibited. Definitely a spectacular attraction is the Troyan Monastery. It was built in the 17th century and is among the most distinguished Christian monuments in Bulgaria. 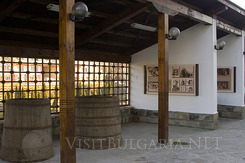 sample the traditional Bulgarian "Troyan" Plum Brandy. Sports and tourism: Beklemeto Ski area (1360 m above the sea level) is located 20 km from Troyan. The complex encompasses skiing facilities and a skiing school during the winter. Beklemeto offers a ski slope for downhill and slalom races. There are also many hiking routes in Troyan region. One of the most attractive ones is within the "Kozyata Stena" (i.e. The Goat's Wall) preserved area. It is a real botanic paradise, featuring than 40 extinct and preserved plant species. One of their most amazing representative is the so called "white star of the mountain" - the Balkan Mountains edelweiss. Troyan is also part of a trekking route, known as “Kom Emine”, going through the crest of the Central Balkan Mountains. Many off-road activities, safaris and paint-ball competitions are organized in Troyan. Vicinities: Sopot Dam is located nearby. It provides good opportunities for water sports snd fishing. Nearby the villages of Oreshak and Shipkovo are situated as well. In Oreshak the National Fair of Traditional Arts and Crafts is organized. Shipkovo is popular with its mineral waters. Shipkovo Spa has an outdoor swimmig pool with mineral water and offers balneotherapy procedures. Part of Troyan is included in the Central Balkan Mountain National Park. Within te park Kozya Stena, the smallest nature reserve and Steneto biospheric nature reserve are situated.